Our machine is highly advanced, using technology that carries two medical certificates, one for cardio vascular and the other for radio frequency. LipoFirm Plus is an advanced technology radio frequency device capable of treating different types of imperfections with immediate and long lasting results, by applying volumetric heat to deep tissue (3-10mm). The Ultrasonic Cavitation, also known as aesthetic cavitation is a relatively new technique that applies a phenomenon known as physics to aesthetics. This phenomenon is called cavitation and is a very smart way to reduce fat, because it is converted into a liquid and then is naturally eliminated with urine. Nowadays the ultrasonic cavitation is considered as an alternative treatment to surgical liposuction as a non invasive procedure with results obtained in very short time scales. Ultrasonic cavitation reduces fat cells with certain manipulation techniques, using a hand piece that is placed precisely on the skin in the area to be treated. The machine emits ultrasounds that form bubbles in the tissues where the fat cells are located. The bubble expands and is immediately compressed afterwards. The temperatures increases due to sudden variety in pressure and the bubble implodes. This implosion damages the fat cells, reducing the localised adiposity. The fat contained (triglycerides) fragments into diglycerides that are expelled via the urinary system. This is a very safe procedure that can be carried out on the majority of clients, there are relatively few contraindications. Radio Frequency is a non-invasive way of tightening loose of lax skin around the forehead, eyes, cheeks, mouth, jaw line and also the the area under the chin/neck as well as the décolletage. This is a great way of reducing fine lines and wrinkles, enlarged pores and improving skin tone and texture, resulting in improvements in dull skin. It is also fantastic for body tightening (Bingo wings and Mummy tummy!). After treatment the client can return to daily routine immediately. Radio Frequency treatment uses electrical pulses. Through a variety of handpicks it heats the dermis, the deepest skin layer, without damaging the epidermis, the top layers of the skin, to stimulate new collagen growth and provide an improvement in skin laxity and appearance, this remodels and enhances dermal density with minimal risks. 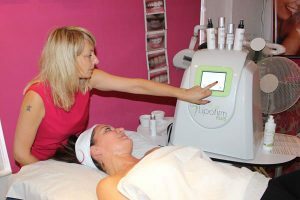 The generated heat causes local contraction of the collagen fibres, thereby immediately tightening the skin to remodel and rejuvenate the previous effects of ageing. The local fibre blasts stimulate the collagen formation by heating the dermis and it then acts as a new foundation for the skin. This produces further delayed tightening, which only becomes evident slowly over the next few months. Radio frequency also improves the blood flow ad lymphatic drainage, thereby providing a better oxygen supply and greater toxin clearance. 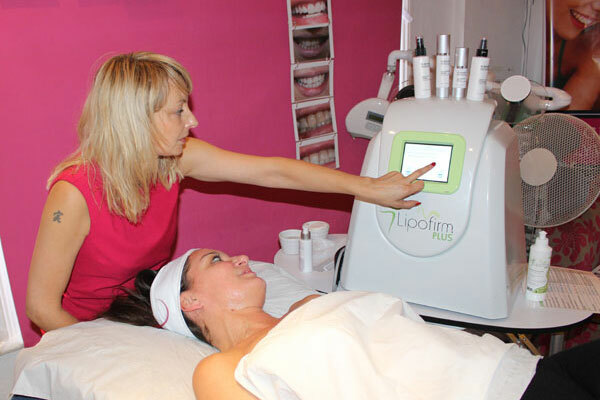 If you want to experience a Lipofirm Plus treatment for yourself, book a consultation today.